Now that I've had a chance to breathe a little bit after becoming a grantee for my work in the 2010 DML Game Changers Competition, it will be interesting to see what the rest of the year has in store for Sackboy and his adventures into stem cell research in 2010-2011. The topic of stem cells in general is such a loaded topic, on top of the wide breadth of information that already exists. Being able to find that balance between ethics and objectivity while trying to make the gaming content both educational and engaging will be very tough, but my team is up for the challenge. I've always been up for making levels that truly expand what LittleBigPlanet is capable to include my levels previously published online such as the Azure Palace series or the Steampunk Samurai found only on the Game of the Year edition of LittleBigPlanet, but this project is going to take everything I have to make it successful... Although, we wouldn't be here if my team wasn't ready for it. With the release of LBP2 later on this year, the plethora of options in that game will only strengthen everyone's ability to deliver an amazing educational module. And with the help of HASTAC and their affiliates, we have the backing to truly make it happen. 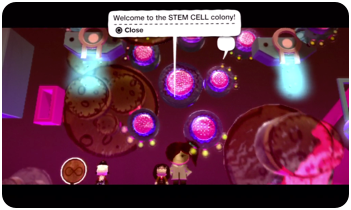 But on a personal note, I do want to make Stem Cell Sackboy one of the best educational gaming experiences one can play. It definitely is a lofty goal, but I'm determined to do so. Just like with any blog, I will be posting updates on Stem Cell Sackboy, both major and minuscule. Also, other information will be posted on the actual Stem Cell Sackboy Project Website. On an aside, I'd like to thank everyone at HASTAC and DMLCenter for the lovely experience in New York a couple weeks back. It's been great meeting the staff and the winners of the competition and I'm sure we'll be keeping tabs on each other in our progress as the year moves on. But for now, I'll see you guys at E3! I agree! I'm so curious how all of the Game Changers will handle this amazing challenge -- making a game both educational and engaging. In one way or another, I would imagine everyone involved in this design process can identify with your quote, "Being able to find that balance between ethics and objectivity while trying to make the gaming content both educational and engaging will be very tough." It will be fascinating to follow the process that you and your team go through, so keep us updated! It's a challenge that our whole digital media & learning field faces (although you have the distinct advantage of NOT being a textbook :), so many of us will be interested in hearing about your work. I think its something that a small but vocal sector of the education and gaming worlds are trying to implement and perfect, as evidenced in the Games 4 Change convention a couple of weeks ago. The way all of us learn about the world now is much different from even 15-20 years ago and the classrooms should follow suit. I mean, I would have loved to have this same kind of learning opportunity back when I was in grade school/high school/university! DML Competition Game Changers winners announced!